So, we are several months into 2019 and we can finally see some trends emerging with the digital marketing industry. If you think you’re ahead of the curve because you were getting amazing results in 2018, then think again! The industry is rapidly changing and what worked yesterday may not work today, so keep your marketing strategy up-to-date and stay ahead of the curve. Are you ready to get your estate agency on the right track? Then you need to follow our digital marketing trends for 2019. Let’s begin! We have previously mentioned how crucial it is to use bots as a part of your marketing efforts. Using Facebook chatbots such as MobileMonkey allows you to automate your conversations with customers. They no longer saturate or devalue your customer service experience, AI is a lot more advanced in 2019. Gaining you crucial information for your CRM and allowing you to increase your conversion rate instead of letting people slip away without leaving any information. As it stands, 1.4 billion people currently use chatbots, so if you haven’t got one set up… just think of the number of leads you are missing out on. Gartner, one of the world’s leading global research and advisory firms has predicted that by 2020 customers will manage 85% of their relationship with an enterprise without interacting with a human. And according to a survey conducted by Business Insider, 80% of the companies questioned said they already used or planned to use chatbots by 2020. If your company isn’t planning on using them, then your competition is going to offer a better experience. There will be unique benefits of using a Chatbot for each different company. But what it can do for everyone is save labour costs, as you will no longer need a human to spend time going through missed conversations. It also means that your employees aren’t spending time waiting on a live chat in the hope that someone is going to appear. 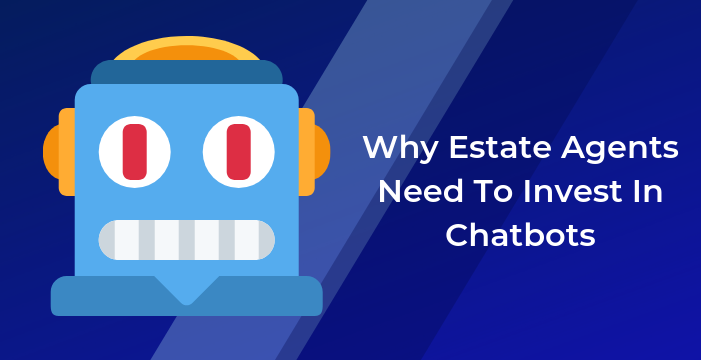 Chatbots are ready 24/7 to answer any enquiries & gather that crucial information that can allow your estate agency to grow faster & much more efficiently. We won’t stop mentioning social media, because it isn’t going away! The platform is growing exponentially and isn’t slowing down any time soon. One of every four Facebook Pages now uses paid advertising as part of their strategy with that number set to increase. A post’s average organic reach is only around 6.4% of the page’s total likes due to Facebook’s new algorithm, that means that businesses need to start mastering the art of paid advertising in order to reach a large number of people. If you are looking for some experts to do all the hard work for you, then you are in luck. Here at Property Webmasters, we have a digital marketing executive who specialises in social media, and has been producing paid advertising campaigns for our clients – the results have been phenomenal, generating leads for as little as £3.00 in some cases and website traffic costing as little as £0.02 for engaged audiences. If you want to see what social media services we provide then you can download our social media strategy, it’ll revolutionise your marketing campaigns. I think this is one that everyone saw coming, we are seeing more and more videos used in digital marketing. At the moment it is one of the most effective pieces of content you can create, especially on platforms such as Facebook, YouTube & Instagram. Why you may ask? Social media algorithms at this present moment are favourable towards video content, they target stats such as ‘average time viewed’, ‘sharing links on messenger’, ‘multiple replies’ & ‘overall engagement’… So when you create a video that is immersive and interactive you will have people tag their friends and engage in a conversation on there and they will watch the video throughout, meaning you will naturally reach a higher amount of people. In 2019, 80% of global internet consumption will be video content! How insane is that?! If you are burying your head in the sand and ignoring the use of videos in your marketing strategy then you are going to get left behind. 100 million hours of video is watched on Facebook every single day… and 85% of them don’t even listen to the sound, it’s all about the visual stimuli. It’s not just social media that it benefits. Using a video in your email newsletters increases the click-through rate by 200-300%, it increases the likelihood of a conversion on a landing page by 80%! 55% of shoppers often research on mobile devices, where visual content helps inform their product selection, so remember to tailor your content for mobile usage as well. These are figures that are too good to be ignored. This one isn’t going to be as critical as the other trends, but it’s still worth venturing into. I remember ages ago dreaming of the days augmented/virtual reality could actually be REALITY. I never expected it to become true, but here we are in 2019 and it is a relatively common part of life now. The global augmented reality market was valued at around $3.33 billion in 2015 and is expected to reach approximately $133.78 billion in 2021. Companies are getting ahead of the trend and are creating totally new ways of marketing/showcasing their products off, As an example Dulux offer a ‘Visualizer’ that allows customers to download an app, load up their camera on their phone and test out different paint colours on the walls, so no longer do people have to go buy testers or take a risk, they can quickly test endless options from the comfort of their home. Thanks to tools such as ARKit and ARCore, AR is enabled on more than 500 million devices, so there is definitely a marketing option available, with that number looking to only increase. Estate agents could use it in the way so people place on a VR headset and can walk around the property without ever having to set foot in there. It’s a perfect way to expand your marketing reach and conversions… If you’re advertising properties that are located in Marbella but targeting people in the U.K. then it’s basically impossible for them to view the home, hindering the likelihood of them purchasing. But if they can tour the house through virtual reality, then they can immerse themselves and get a feel for the property, and imagine what it would be like. It’s a complete game changer.